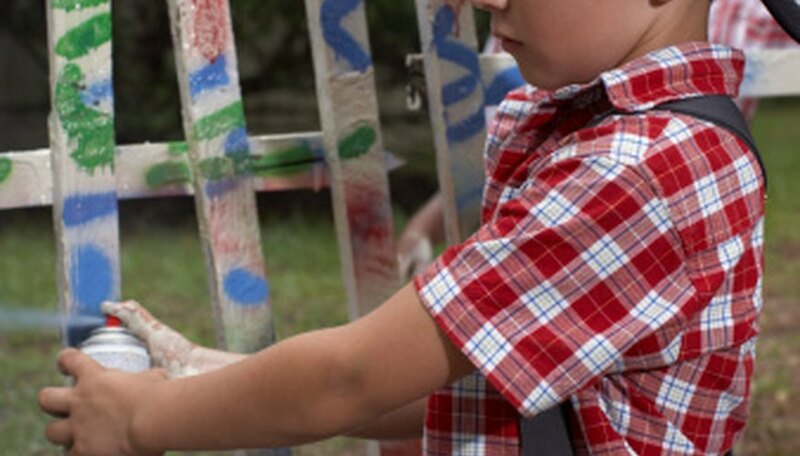 Spraying a wooden fence is the fastest and easiest way to get paint on a fence. Once the paint is applied, a roller is used to push the paint into the wood fibers. This rolling is called back-rolling. Back-rolling ensures a proper paint-to-wood bond. When a fence is prepped, primed and painted properly the paint job should last for as long as the paint manufacturer approximates. Spray on a windless day to avoid getting overspray on undesirable surface. Attach a spray nozzle to a garden hose. Spray the wood fence to wash away all dirt and debris. Spray from top-to-bottom and from one end to the other. Rinse both sides of the fence. Wait 72 hours for the fence to completely dry. More time may be required depending on the weather conditions. Plug the paint sprayer into a 120-volt electrical power outlet. Use extension cords. Turn the "ON/OFF" switch to the "OFF" position. Submerge the suction tube down into the bucket of stain-blocking wood primer paint. Stick the drain tube into the waste bucket. Turn the pressure control knob to its lowest setting. Turn the "PRIME/SPRAY" switch to "PRIME." Hold the spray gun down inside the waste bucket so that it's pointing toward the side of the bucket and pull the trigger. Flip the "ON/OFF" switch to "ON" and watch as the cleaning and preserving solution comes out of the pump chamber through the drain hose. Flip the "PRIME/SPRAY" switch to "SPRAY" as soon as you see primer paint come out of the drain hose. Now watch as the cleaning and preserving solution in the spray hose empties into the wait bucket. Release the spray gun trigger as soon as you see primer paint coming out of the spray tip of the spray gun. The pump will continue pumping as pressure behind the paint in the hose increases. Uncoil the spray hose so that you are standing at one end of the fence line. Hold the tip of the spray gun about 18 inches away from the fence and pull the trigger. The paint will probably squirt out at this point, because the pressure is so low. Adjust the pressure control knob until the primer paint comes out of the spray time atomized. If paint dust is blowing everywhere, the pressure is too high if the paint sprays in lines then it's too low. Adjust it to spray evenly. Spray up and down each slat in the fence line. Keep the gun at an even distance from the fence throughout the spray pass. Move at an even pace to avoid piling up too much paint or not enough paint in one area. Spray a ten foot section of fence at a time. The sprayer's main purpose is to quickly get the paint on the surface. Place a 1-inch nap roller cover over the spindle of a 9-inch roller frame and screw and extension pole into the end of the roller handle. Spray paint on the roller nap to soak it with paint. Set the spray gun down. Roll over the painted section of fence with the roller. Keep even pressure on the roller to allow the nap fibers to fill the fence slats with paint. Use a mini roller for the hard to reach areas and a paintbrush for the cracks in between the slats. Be aggressive during this rolling and brushing process. Roll up and down and side-to-side. Brush up and down. The idea is to even out the highs and lows in the paint to ensure proper paint coverage of the fence. Use the mini roller on the top ends of the fence slats and the top ends of the fence posts. Spray another 10-foot section of fence and then roll and brush it just like the first sections. Roll out all lap lines created by the edges of the roller until the paint is evened out. Repeat this spray, roll and brush technique until both sides of the fence have been primed. Wait 24 hours and then apply the exterior wood finish paint the same way the primer was applied. Turn the "ON/OFF" switch to the "OFF" position. Turn the pressure control knob to its lowest setting. Leave the "PRIME/SPRAY" switch in the "SPRAY" position. Remove the suction tube from the primer bucket and plunge it down into the finish paint bucket. Do this as quickly as possible so you don't have to prime the pump again. Point the spray tip of the spray gun down into the primer paint bucket and pull the trigger. Turn the "ON/OFF" switch to the "ON" position and watch as the primer pumps out of the hose through the spray gun and spray tip. Release the trigger of the handle when you see finish paint coming out. The sprayer is ready to spray the finish paint. Turn up the pressure control knob to the appropriate setting and then use the spray, roll and brush technique. Wait 24 hours after the first coat of finish paint was applied and apply a second coat if needed. The paint sprayer is cleaned out the same way paint is loaded into it. Remove the suction tube from the finish paint and put it in a bucket of water. Point the spray tip of the spray gun into the finish paint bucket and watch until you see water coming out. Release the trigger. Point the gun back into the water bucket and let the water recycle through the pump, hose and gun. Put the suction tube in a fresh bucket of water and continue this process until the water coming out of the pump, hose and gun runs clear. Use paint thinner to clean out a sprayer if oil-based paint was used. Wear safety goggles to protect your eyes from paint spray. Wear a paint respirator when spraying paint. Don't spray oil-based paint near open flame as it is extremely flammable.